When evaluating asphalt pavement, including asphalt-paved parking decks, ETC recommends core sampling as part of our investigative service. 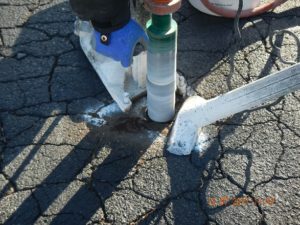 Extracting a core sample of the pavement can be beneficial in telling the history of the pavement construction as well as the conditions of the sub-base profile beneath the asphalt. The cores can also tell the story of past pavement work, including structural repairs, pavement membrane (fabric) installation, and multiple repaved layers of asphalt, which can help minimize change orders during the work. This information assists us in developing specifications necessary to address the pavement rehabilitation needs. Typically, pavement deterioration can be traced back to the sub-base design (the materials below the pavement) and their manner of installation and compaction. What we commonly look for is a stone aggregate material in thicknesses that exceed the pavement profile. In many instances, our sampling will also reveal the condition of the sub-base (or soils) below the pavement as well. Soils with high clay content can affect our recommendations for the type of rehabilitation work. If these conditions are not defined before scope preparation and implementation, the pavement rehabilitation work may not adequately address the needed issues. This can lead to a reduced pavement life and more costly, long term repairs. Don’t hesitate to contact us for all your pavement questions and concerns. We can have a member of our pavement consulting and inspection staff visit your property to provide a pavement evaluation proposal, free of charge.